For these cookies, I used white granulated sugar for the dough itself but to sprinkle on top, I used a coarser, raw sugar. If you have sanding sugar at home, that’d be lovely too as it will keep its shape in the oven. 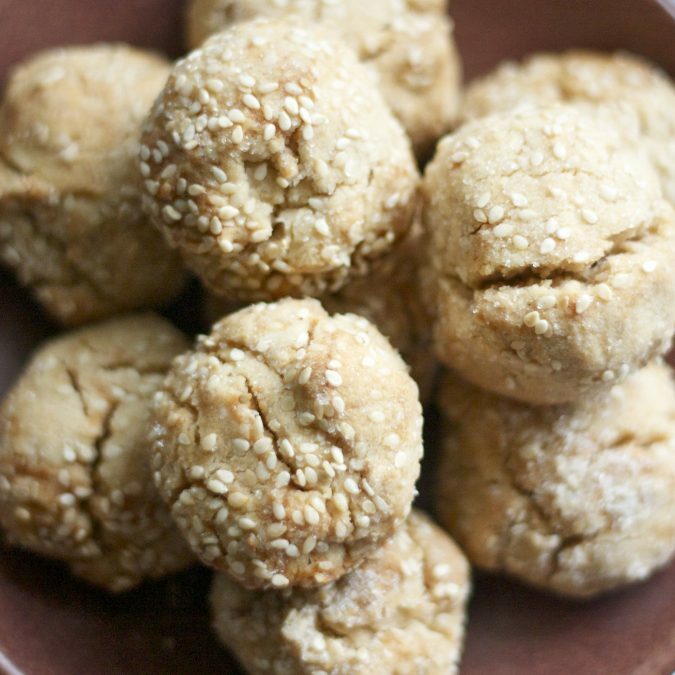 And next time I make these, I’m going to experiment with using white whole-wheat flour. I think they’re sturdy enough in nature to accommodate whole-grain flours without even the slightest shrug. Beat together butter and 1/2 cup sugar in a large bowl with an electric mixer at medium-high speed until pale and fluffy, about 3 minutes, then beat in tahini, honey, vanilla, and 2 tablespoons sesame seeds. Reduce speed to low and add flour mixture in 2 batches, mixing until a crumbly dough forms. Transfer dough to a sheet of plastic wrap and press into a disk. Chill dough, wrapped in plastic wrap, until firm, at least 1 hour. Stir together sesame seeds and 2 tablespoons sugar in a small bowl. Roll dough into 1-inch balls, then roll balls 1 at a time in seeds to coat and arrange 2 inches apart on lined baking sheets. Bake until cookies are starting to crack, 12 to 15 minutes total. Cool on sheets 10 minutes (cookies will be very fragile when hot), then transfer to a rack to cool completely. *Hulled sesame seeds are preferable for baking but they’re usually not labeled as such. Look for seeds that are pale ivory in color; they’re more delicate than the mottled beige ones, which still have their outer coating.